Steel beam theory is used to find the approximate value of the moment of resistance of a doubly reinforced beam specially when the area of compression steel is equal to or more than the area of the tensile steel. (i) Moment of resistance of compression concrete and the corresponding tensile steel (Ast1) i.e., moment of resistance of balanced section (M1). (ii) Moment of Resistance M’ of the compression steel (Asc) and the additional tensile steel (Ast2). (i) Concrete is completely neglected. (ii) The moment of resistance is taken equal to the amount of the couple of compressive and tensile steel. (iii) The permissible stress in compressive steel is taken as equal to the permissible stress in tensile steel. 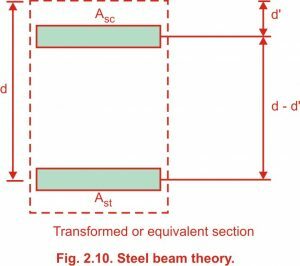 The Transformed or equivalent section as per steel beam theory is shown in Fig. 2.10. Steel beam theory : in a simple words, we assume there is no concrete in tension zone because concrete is weak in tension. similarly in double reinforcement if you assume concrete is weak in compression also( steel is more than 10 times stronger than concrete in compression) then we get same amount of steel in both tension and compression. all the moment will be resisted by the steel only. no role of concrete. so we call such beam as steel beam in a steel beam theory.